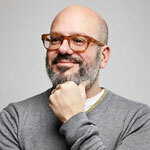 The Pullo Center at Penn State York welcomes award-winning comedian David Cross to its stage on Monday April 4, 2016 at 7:30 p.m.. Ticket prices are $58 and $45, and will go on sale January 15 at 10:00 a.m.. Members can order now. Tickets can be purchased at The Pullo Center Box Office, charge by phone at 717-505-8900 or online at ThePulloCenter.com. "I am extremely excited to get back out on the road after five long years away,” said Cross. “I was very busy writing for The View, but now that the kids are off to college, my wife's regiment has been transferred to McMurdo Station in the South Pole, and I'm near completion on Fallout 4, it's time to start up the bus and bring my patented, fart-inducing laugh winces to a town near you. See you soon!" Cross last toured in 2009 with a solo stand-up show in support of his New York Times Bestseller, I Drink for a Reason. The hugely successful comedy show was filmed at Boston's Wilbur Theater for a special, entitled “Bigger and Blackerer,” which premiered on EPIX in April 2010 before being released on CD and DVD by Sub Pop. His previous comedy special, "David Cross: The Pride is Back," aired on HBO in 1999, and was named one of the 25 best stand-up comedy specials and concert films of all time by ROLLING STONE in July 2015. Cross has released two other comedy albums – the Grammy Award- nominated, “Shut Up You F*cking Baby” and “It's Not Funny.” In 2003 he released the DVD, "Let America Laugh," a documentary film of his groundbreaking stand up tour of alternative, indie rock clubs.